A group of refugees from the Western Sahara living in camps in the Algerian desert flew home on Friday to visit relatives in the first of a planned series of exchange visits organised by the UN refugee agency UNHCR. The plane flew back to Tindouf in Western Algeria carrying a group of people living in the Moroccan-ruled territory who were anxious to see long-lost relatives in the refugee camps, UNHCR spokesman Peter Kessler told IRIN by telephone from Geneva. The programme of five-day exchange visits is the latest in a series of measures to improve contact between the 165,000 refugees who support the Polisario movement that is fighting for the independence of the former Spanish colony, and their relatives back home. In many cases they have not seen each other for nearly three decades. Twenty-one Western Saharan refugees boarded a plane in Tindouf on Friday morning to visit families and friends in their homeland for the first time since the Western Sahara was plunged into civil war in 1976. “People are very excited and happy to be seeing their families for the first time in decades,” Kessler said. The passengers on the plane included several children who had been born in the refugee camps in the far west of the Algerian desert. This was their first ever visit ‘home’. The Antonov 26 aircraft which flew them to Laayoune, the main city in the Western Sahara, was due to return to Tindouf with 19 Western Saharans who had requested to visit members of their family in the camps. The family exchange visits are the latest move by UNHCR to bring the exiles and residents of the Western Sahara closer together as UN officials endeavour to persuade Morocco and the Polisario movement to agree to a political settlement. In January, UNHCR set up a telephone service in one of the five refugee camps, which refugees can use to make free calls to loved ones back home. Kessler said the service had proved popular and UNHCR was in the process of extending it to all five camps. A mail service is scheduled to begin soon, though the parties involved - Polisario, Morocco and Algeria - have still to agree how it will operate. The UN first conceived the free telephone service in 1999. It was initially launched in April 2003, but only operated for one day before it was closed at the request of Polisario. 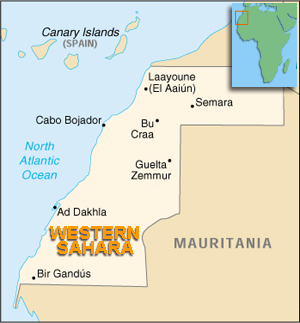 The movement, which wants to see an independent Western Sahara, was established in 1973, but when the Spanish withdrew from the territory two years later, Morocco moved in and the area was plunged into civil war. Armed clashes came to an end in 1991, but UN-backed negotiations have had little results since then. Kessler made clear that the family visits did not mark the start of an official repatriation programme, but he said there was nothing as such to prevent refugees visiting the Western Sahara from staying on there at the end of their scheduled five-day visit. “These people are adults, or most of them are, they are free to make up their own mind,” Kessler said. The camps in Tindouf are operated by UNHCR , but Polisario has a great deal of control there. “Polisario plays a major role in the relief effort,” Kessler confirmed. He said food often runs short in the camps, not least because the Western Sahara dispute and the plight of the refugees which it created has been largely forgotten by the wider world. With only a small and scattered population of nomads and fishermen, the desert territory has few natural resources and has largely dropped off the international agenda. “These are forgotten refugees from a crisis of long ago. Getting food to these refugees has been a perennial problem – for decades,” said Kessler. There are still many tents among the more permanent mud and brick structures in the camps near Tindouf. The tents, the refugees say, serve as a reminder that they are only temporary residents and that one day they will go home for good.